VANCOUVER, BRITISH COLUMBIA--(Marketwired - July 18, 2014) - Legend Gold Corp. (the "Company" or "Legend") (TSX VENTURE:LGN) is pleased to announce the results from 714 m of infill reverse circulation ("RC") drilling in 14 holes. The drill holes were located to provide intersections in oxide mineralization in areas where sulfide grades had been extrapolated into the oxide. The results provide confirmation of the continuity and grade of oxide mineralization on the FT deposit. The FT deposit lies with the Tabakorole Exploration Permit Application area which replaces the Tiekoumala Exploration Permit. Significant intersections from the latest round of drilling are shown in the table below. Intercepts are calculated at 0.5 g/t cut off and with up to 2 meters of internal waste. True widths of grade intervals are approximately 85% of the downhole intercept based on the general dip of the mineralization. The oxide resource currently stands at 34,000 oz at 1.01 g/t gold in the indicated category and 35,000 oz at 1.14 g/t gold in the inferred category. 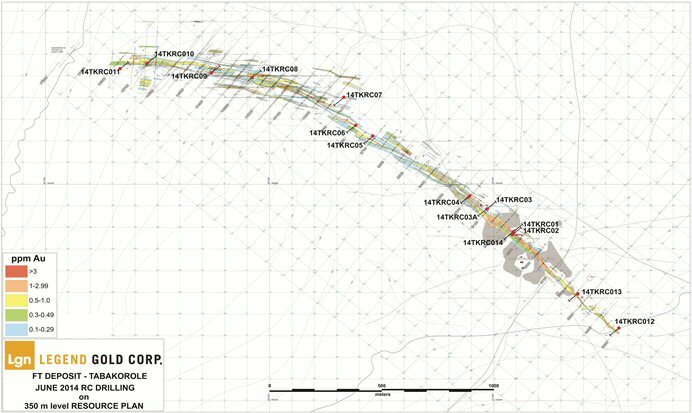 A recalculation of the oxide resource incorporating the new drill intersections is being prepared. The sulfide resource remains 207,000 oz at 0.94 g/t gold in the indicated category and 318,000 oz at 1.03 g/t gold in the inferred category (A. Daniels, Technical Report 2007). The entire volume of chips from each reverse circulation interval were collected, dried and split on site into an approximately 2 kg subsample using a Jones splitter on a meter by meter basis. The 2 kg sample was submitted to SGS Laboratories ("SGS") in Bamako for crushing, grinding and 50 g gold fire assay with AAS finish. Approximately 5% of both high and low grade, oxide gold standards as well as 5% blanks were inserted into the sample stream before delivery of the samples to SGS. Every 20 samples, a duplicate sample was created from the chip rejects and included in the sample stream. RC pulps as well as RC rejects are kept as a reference. A QA/QC analysis was performed on the results of the standard, duplicate and blank sample assays. If results of adjacent standards fell outside two standard deviations of the standard control assay, samples from that batch were flagged for re-assay. All standards, duplicates, and blanks passed the QA/QC validation protocols. Dr. Demetrius Pohl, PhD., Certified Professional Geoscientist (CPG), Legend's V.P. of Exploration, is the Company's Qualified Person for the purposes of National Instrument 43-101 Standards of Disclosures for Mineral Projects of the Canadian Securities Administrators, and has approved the written disclosure of the technical information contained in this news release. Legend is a mineral exploration and development company focused on exploring for gold in the Republic of Mali, West Africa. Legend's principal projects include the Diba, Lakanfla, Mougnina, and Tabakorole projects. This press release has been prepared by Legend Gold Corp. Neither the TSX Venture Exchange nor its Regulation Service Provider (as that term is defined in policies of the TSX Venture Exchange) accepts responsibility for the adequacy or accuracy of this release. Statements contained in this news release that are not historical facts are "forward-looking information" or "forward-looking statements" (collectively, "Forward-Looking Information") within the meaning of applicable Canadian securities legislation and the United States Private Securities Litigation Reform Act of 1995. Forward-Looking Information includes, but is not limited to, disclosure regarding possible events, conditions or financial performance that is based on assumptions about future economic conditions and courses of action; the timing and costs of future exploration activities on the Company's properties; success of exploration activities; permitting time lines and requirements; time lines for technical reports; planned exploration and development of properties and the results thereof; and planned expenditures and budgets and the execution thereof. In certain cases, Forward-Looking Information can be identified by the use of words and phrases such as "plans", "expects" or "does not expect", "is expected", budget", "scheduled", "suggest", "optimize", "estimates", "forecasts", "intends", "anticipates", "potential" or "does not anticipate", believes", "anomalous" or variations of such words and phrases or statements that certain actions, events or results "may", "could", "would", "might" or "will be taken", "occur" or "be achieved". In making the forward-looking statements in this news release, the Company has applied several material assumptions, including, but not limited to, that the current exploration and other objectives concerning its mineral projects can be achieved and that its other corporate activities will proceed as expected; that the current price and demand for gold will be sustained or will improve; that general business and economic conditions will not change in a materially adverse manner; the continuity of the price of gold and other metals, economic and political conditions and operations. Forward-Looking Information involves known and unknown risks, uncertainties and other factors which may cause the actual results, performance or achievements of the Company to be materially different from any future results, performance or achievements expressed or implied by the Forward-Looking Information. Such risks and other factors include, among others, risks related to the availability of financing on commercially reasonable terms and the expected use of proceeds; operations and contractual obligations; changes in exploration programs based upon results of exploration; future prices of metals; availability of third party contractors; availability of equipment; failure of equipment to operate as anticipated; accidents, effects of weather and other natural phenomena and other risks associated with the mineral exploration industry; environmental risks; certainty of mineral licenses; community and governmental relations; delays in obtaining governmental approvals or financing; fluctuations in mineral prices; the nature of mineral exploration and mining and the uncertain commercial viability of certain mineral deposits; the Company's lack of operating revenues; governmental regulations and the ability to obtain necessary licenses and permits; changes in environmental laws and regulations and changes in the application of standards pursuant to existing laws and regulations which may increase costs of doing business and restrict operations; risks related to dependence on key personnel; and estimates used in financial statements proving to be incorrect; as well as those factors discussed in the Company's public disclosure record. Although the Company has attempted to identify important factors that could affect the Company and may cause actual actions, events or results to differ materially from those described in Forward-Looking Information, there may be other factors that cause actions, events or results not to be as anticipated, estimated or intended. There can be no assurance that Forward-Looking Information will prove to be accurate, as actual results and future events could differ materially from those anticipated in such statements. Accordingly, readers should not place undue reliance on Forward-Looking Information. Except as required by law, the Company does not assume any obligation to release publicly any revisions to Forward-Looking Information contained in this news release to reflect events or circumstances after the date thereof or to reflect the occurrence of unanticipated events. About this company Legend Gold Corp.